�	BA (1994) and MA (1997) in History from the College of Arts University of Kufa . �	Ph.D. in modern and contemporary History from the University of Baghdad (Iraq) (2008). �	Teacher at the College of Education, Beida, ( Libya) (1997) . �	Teacher and researcher in the College of Education and Science, University of Sebha ,( Libya ) (2001). �	Teacher and researcher at the College of Islamic Sciences, University of Kufa (2005) . �	Teacher and researcher in the College of Education for Girls, University of Kufa (2009) . �	Chairman of the Department of History at the College of Education for Girls, University of Kufa (2010). �	Professor of graduate studies in the Department of History / College of Education for Girls in 2011 �	Secretary General of the Central Library, University of Kufa (2012). �	Scientific Associate of the Faculty of Archaeology / University of Kufa in 2014. �	Local History of the Kufa, Najaf city. �	Shia political and social. History. �	Iraq's contemporary and modern History. �	Arab's contemporary and modern History. �	Labor movements in Najaf. �	University of Kufa private - Documentary Study. �	Endowment lands and the Valley of Peace between the religious heritage and government documents. �	Administrative status of the city of Najaf and its impact on the political activity of the Hoza. �	Najaf and the first parliamentary elections - Documentary Study. �	Ways to improve the performance of the members of teaching staff university. �	The role of Imam Sadiq (AS) in establishing chemistry. 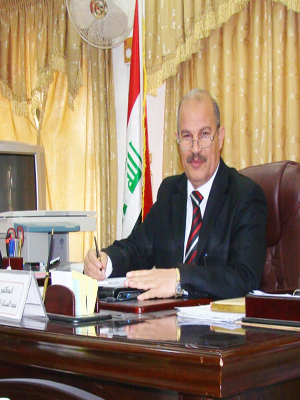 �	Backwardness and corruption in the administrative system in Iraq . �	Historical notation of Alburaqi (a study in the curriculum and resources in the light of historical manuscripts). �	The role of Najaf in Iraq uprising of 1952 _ Documentary study. �	The history of democratic development in contemporary Iraq. �	University of Kufa and the idea of incorporation and development.